FROM THE RECTOR We were delighted to welcome a local adult education group of ladies, Knockmore Crochet Group for a tour of the church and a talk on the Church of Ireland which was followed by lunch in the Village on Tues 21st June. Our ‘Crafty Chatters’ were meeting that afternoon so the crochet ladies came back to the parish hall to meet with fellow crafters and to admire their work. The following day I attended a farewell for Rev. Katherine Keogh, the Methodist minister in Tallaght, who left to go down to Gorey, Co. Wexford. Katherine and I worked together running an Alpha course and subsequently on What’s so Amazing Grace? On Thurs 21st I went along to the Jubilee of the ordination of parish priest for the local parish of St. Aongus, Fr. Ben Moran. It was lovely to go to our Bowls Club annual BBQ on such a beautiful evening on Sat 23rd June. It was great for the club members to be able to sit out in the warm weather until after 10pm. The parish school had their Sports Day on 22nd June followed by the 6th class graduation on the evening of Wednesday 27th . I was delighted to be able to wish all the pupils in the class well for the future. The parents put on a great spread and a lot of work went into making the evening a night to remember for the children. The staff lunch followed the next day in the Maple Tree in Saggart, the end of another successful school year and a well deserved rest for all. On Sat 30th June, the now annual festival ‘Tallafest’ took place in and around Tallaght Village. We had the parish buildings open to the public. An interesting historical talk was given on the promotion of a fondly remembered local venue ‘The Embankment’ was given by Eamonn Maloney, ex mayor of Tallaght. The annual Dominican blessing of the graveyard was on Sunday 1st July followed by Mass in our church, as the Priory have a Polish Mass at the same time on Sunday afternoons. On the same day I was delighted to be asked to a Canadian parishioner’s home for a BBQ to celebrate Canada Day. The 1st – 6th July saw the start of D & G summer camp, Lionel was a leader with Amy helping in the evenings after work. I am worried about the future of these camps as there appears to be a lack of leadership. They serve a very important role for the youth of the Dioceses and I’d hate to see this annual summer camp, which provides the youth with an opportunity for fellowship, coming to an end. We welcomed a new tenant to the parish hall in September, Tallaght Adult Community Training (TACT) who had been in St. Dominic’s school for roughly thirty years. St. Dominic’s needed the room that they had been using for it’s expanding school numbers so TACT are now using our hall in the weekday mornings. They have given us their plastic bucket chairs, which we are delighted with, as our old chairs were literally on their last legs! Over the summer we had a number of tours of the Church and graveyard. On Thursday 12th July we had a tour and were joined by David Neary. David gives historical tours of Donnybrook cemetery where Hancock, a former parishioner is buried, Hancock wrote the ‘History of Tallaght’. I was invited to Glenasmole Crossroads Dancing by the local parish priest for prayers as part of the 150th anniversary of Bohernabreena Church celebrations. It was very authentic with people making a fabulous effort with their costumes. Dublin University’s (Trinity) Mission at Chota Nagpur was established in 1891. A dispensary and hospital were opened in 1892, and a girls’ and boys’ high school as well as a primary school followed by 1897. Over the next 70 years, the DU Mission community was staffed by missionary clergy, doctors, nurses, teachers and lay people from Ireland. On Monday 17th September I was invited to a reception hosted by Archbishop Michael Jackson for the Bishop from this Indian region in the Mansion House because of our connection to India through our Indian Parishioners. The 21st was ‘Culture Night’ and as a result of our Heritage Month tours we were approached by the organisers of Culture Night to open the Church for visitors, a tour and talk was given to those who turned up. On 24th September I went to Mount Seskin Community College where some of the students took part in a survey to see what they knew about each denomination, mainly RC, C of I and Methodist and on 27th I attended the ICA Remembrance Service in Tymon North. We are now back into the full swing Parish life after the summer break. This Newsletter is due out on our Harvest Sunday and I look forward to seeing the readers of the Newsletter at 3.30pm when we give thanks for all that is good in our lives. FUNERAL The funeral and burial of Sam Lewis took place in St. Maelruain’s on Mon 25th June. We extend our deepest sympathies to Sam’s wife Noelle, daughter Claire and to his wider family and friends. BAPTISM Bobby Stephen, son of Stephen Acres and Ailish Berkley was Baptised on Sunday 15th July. We pray for Bobby and his family as he begins his Christian life. THE TALLAGHT PERSON OF THE YEAR AWARDS launch took place on 29th September. It is a community run awards programme to recognise and celebrate unsung heroes, volunteers and active members of the community across various walks of life in Tallaght. Nominations for the 35th Annual Awards 2018 run for 4 weeks from 1st October to 29th October 5pm. If there is some one that you would like to nominate log on to http://tallaghtpersonawards.ie/nominate/ to register your nomination. The awards night takes place on Friday 16th November. BOWLS Our club reopened on Tuesday 11th September and it was lovely to see all our members back and looking forward to the new season. We send sympathy to Marie Gordon and family on the death of Marie's sister Breda who died over the summer. Congratulations to Stillorgan Bowling Club on their 50th Anniversary of bowling. WHIST DRIVE Our next Whist Drive take places on Monday 15th October in the Small Hall, all welcome! 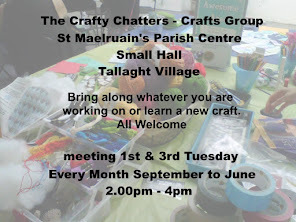 CRAFTY CHATTERS Crafty Chatters meet on the 1st and 3rd Tuesday of each month until the end of June 2019. We meet from 2-4 pm. You are very welcome to come and bring along whatever craft you are working on or learn a new one! 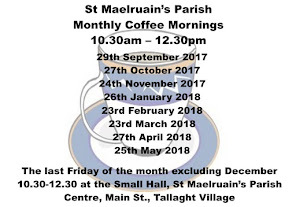 PARISH COFFEE MORNING Our next Coffee Morning takes place on Friday 26th October at 10.30am. Everyone is asked to bring along a photo of themselves as a child or teenager. When the photos are displayed we will all have a go at guessing who's who. As usual, there are absolutely NO prizes for guessing all photos correctly!! MOTHERS UNION We finished our last season with a great night in the civic theatre at Shout the Mod Musical and as usual we were well looked after by the great staff in the civic. Now after a wonderful summer we are starting our new season and have an interesting and varied programme which we hope you enjoy. Our season opened on Monday 10th September with our opening service of Holy Communion with Canon William celebrating and Rev Avril preaching. Avril gave us an interesting sermon about Mary Sumner the founder of Mothers Union and how the organisation was started many years ago. The theme for this year is "in Mary Summer's footsteps". We would like to thank Gerard Moody who played the organ for us, so thank you Gerard. After the service we had a lovely cup of tea and goodies so thank you to everyone who supplied the tea. The annual festival service was in Monkstown a few days later, on a really terribly wet night so thanks to those who braved the dreadful elements to go to what was a lovely service once we got inside! Our October meeting is on Saturday 6th October when we will visit Taney flower festival. On Monday 12th November Geoff Scargil from Protestant Aid will be coming to talk to us and we look forward to hearing what he has to say to us. If you know of any boys who would be interested in taking part please contact the Parish office 462 6006, we’d love to have them. BIBLE STUDY of the readings for the following Sunday continue on Tues evenings at 8.00pm upstairs, Parish Centre, all welcome! 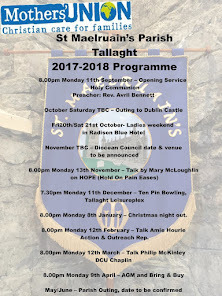 PRAYERS FOR TALLAGHT continue on Monday evenings at 8.00pm, in the Main Hall, needs your support. THE THREE TENORS (Shane Morgan / Dominic McGorian / Derek Moloney) pre – Christmas concert in Firhouse Parish Church – tickets €25 contact the parish office at 452 4702 Sinatra, The Dubliners, Pavarotti ……. CONCERT in St. Dominic’s Church on 19th Oct at 8pm, music from their youth choir, folk group and more. 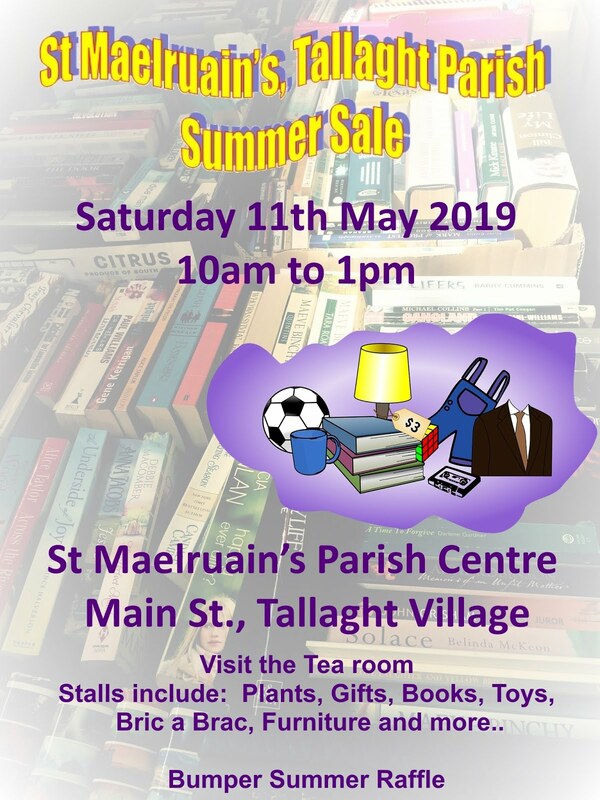 In aid of St. Dominic’s youth choir, donations welcome! CROSSROADS is a Church of Ireland Social Club for those in their 20’s & 30’s and a little older….They meet on the last Friday of the month in Buswells Hotel, Molesworth Street, Dublin. 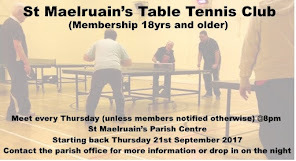 For more details contact David on 085 7272 019. You can also follow them on Facebook, to join Crossroads Group, please send message request to Valerie Raitt Thomas or Beryl Healy.